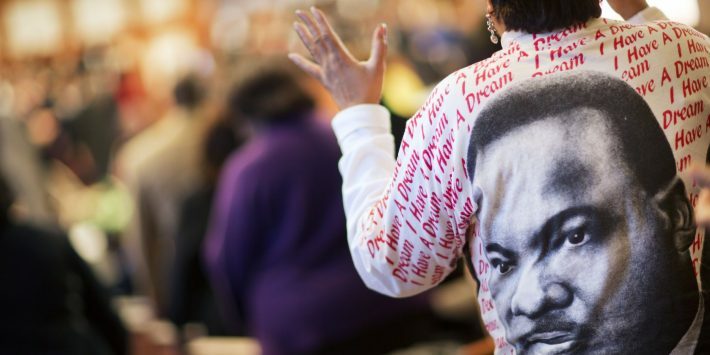 Gail Hollin wears a shirt bearing the image of the Rev. Martin Luther King Jr. as she sings during the King holiday commemorative service at Ebenezer Baptist Church where he preached, Monday, Jan. 18, 2016, in Atlanta. 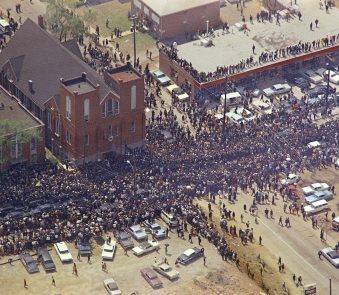 Beloved civil rights leader Martin Luther King Jr. lived much of his life in the Sweet Auburn neighborhood of Atlanta. He graduated from Morehouse College, served as co-pastor at Ebenezer Baptist Church, and his final resting place lies at the Martin Luther King, Jr. National Historic Site. King has had a tremendous impact on Atlanta’s community and culture, and for his birthday celebration the city will be filled with opportunities to learn about and explore King’s legacy. Additionally, a number of volunteer and service opportunities are available throughout the city for Atlantans who may want to give back during the day of service. What: The Center for Civil and Human Rights will be hosting special events to celebrate Martin Luther King Jr. Day this January. Guests can participate in a community sing-a-long which “celebrates the life and message of Dr. Martin Luther King, Jr. through song,” according to the Center’s webpage. They can also hear recitations of King’s speeches, watch a film screening and more. What: This 5K road race through Piedmont Park will allow runners to grab their Peachtree Road Race qualifying time while they support a variety of causes during Martin Luther King, Jr. Day. Drummers will line the racecourse to keep runners moving as they traverse diverse terrain, from bridges to gravel to roads. Runners will receive a commemorative T-shirt as well as an ice skating pass. What: From 10 a.m. to 5:30 p.m., the Atlanta History Center will be opening its doors to the public for no cost and giving visitors a chance to learn about the legacy of Martin Luther King Jr. During the day, families can participate in events such as a conversation about and screening of “A Trek to the River’s Edge,” a documentary about the Atlanta Student Movement. Families can also participate in a theatrical simulation of a Freedom Ride, watch a reenactment of Rosalyn Walton of the Atlanta Nine speaking to a journalist about being a civil rights trailblazer and more, according to the History Center website. What: The MLK March Committee is hosting its annual Martin Luther King, Jr. Commemorative March, which is meant to promote ideas of social justice, according to the event website. Before the march, visitors will be able to attend the free Bayard Rustin/Audre Lorde Breakfast at the Loudermilk Center in Atlanta. In the days preceding the march, participants can attend a youth conference, worship together and more. When: Jan. 15, 2018 from 11 a.m. to 3:30 p.m.
What: The Children’s Museum of Atlanta is commemorating the memory of Martin Luther King Jr.’s birthday with a series of family-friendly presentations and activities that will teach families about the history of King and the civil rights movement as a whole. Families can watch a recreation of King’s famous “I Have a Dream” speech, learn about important figures from the civil rights movement and build crafts themed on Martin Luther King Jr.’s message, according to the museum website. 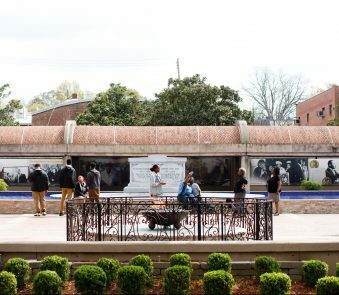 What: Martin Luther King Jr.’s alma mater, Morehouse College, is hosting a series of events to commemorate King’s work and the civil rights movement. 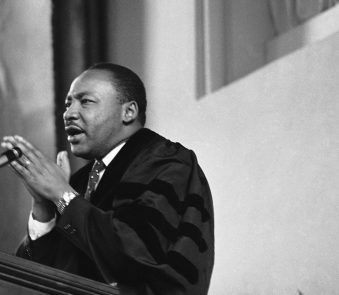 Throughout the month, visitors to the university can participate in a candlelight vigil, hear speakers and lectures, view documents from the AUC’s Martin Luther King Jr. Collection and more. What: The Atlanta University Center’s Woodruff Library is hosting an educational exhibit on the history of the Atlanta Student Movement, which worked as a part of the civil rights movement to hold sit-ins and other nonviolent protests against segregation and racism in the 1960s. The exhibition also explores the legacy the Movement left behind, as well as its influences on contemporary movements, such as Black Lives Matter, according to the library’s webpage. What: The Martin Luther King Jr. National Historic Site is a permanent national park including a museum, King’s birth home, the church where he once preached, and the final resting places of King and his wife, Coretta Scott King. At the visitor center, visitors can sign up for tours of King’s birth home, view a short orientation and learn King’s story with a number of exhibits and galleries within the center. What: Martin Luther King Jr. Day is a national day of service. In 2014 alone, volunteers educated over 58,000 students, gave food to more than 360,000 people and more, according to the Corporation for National and Community Service. This year, Hands On Atlanta has a list of service opportunities around the city to bring together Atlantans passionate about volunteering.